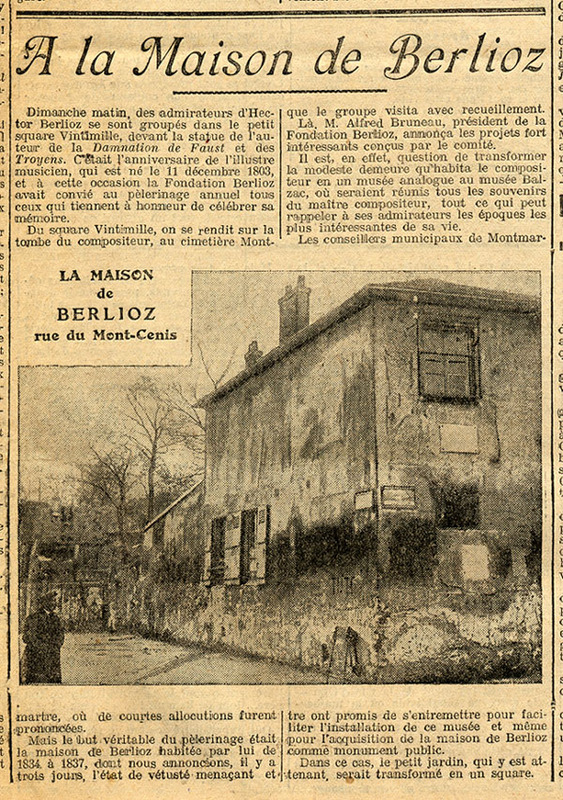 This page reproduces the original text of a report on the annual pilgrimage to Berlioz’s home in Montmartre on 11 December 1910, the anniversary of his birth, organised by the Berlioz Foundation. Henri-Martin Barzun, Jacques Barzun’s father, was the instigator of the Berlioz Foundation in 1908. On the history of this house in the early XXth century reference should be made to the page on Berlioz at Montmartre. The text of the report and the accompanying image were scanned from our own copy of the issue of 13 December 1910 of Le Petit Journal, and are reproduced below together with our English translation of the report. On Sunday morning a few admirers of Berlioz gathered in the little Vintimille Square in front of the statue of the author of the Damnation of Faust and Les Troyens. It was the birthday of the illustrious musician, who was born on 11 December 1803, and on this occasion the Berlioz Foundation had invited to this annual pilgrimage all those who make it a point of honour to celebrate his memory. From Vintimille Square the group went to the composer’s tomb at the Montmartre Cemetery, where short speeches were made. But the real destination of the pilgrimage was the house where Berlioz lived from 1834 to 1837; three days ago we reported on its alarming state of decay, and the group visited it respectfully. M. Alfred Bruneau, president of the Berlioz Foundation, announced on the spot the very interesting plans that the committee has formulated. The project actually involves transforming the modest dwelling where the composer lived into a museum similar to the Balzac Museum, in which all the memorabilia of the master that might remind his admirers of the most salient times of his career would be brought together. The municipal councillors of Montmartre have promised to bring their influence to bear to facilitate the installation of this museum and even to acquire Berlioz’s home as a public monument. Should this happen the small garden attached to the house would be turned into a square. The Hector Berlioz Website was created by Monir Tayeb and Michel Austin on 18 July 1997; this page created on 20 December 2007.